We are Senior Advisors to the Overstreet Comic Book Price Guide and a Charter Member Dealer with the Comics Guaranty, LLC (CGC). For other wonderful items, make sure to visit us at our About Me Page. 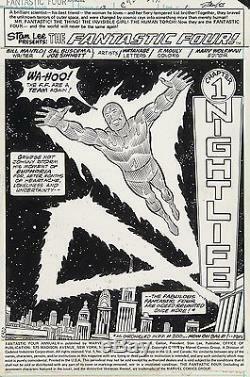 Fantastic Four Annual #13 Original Splash Art by Sal Buscema. Spectacular Title Splash original artwork for Fantastic Four Annual #13 (Marvel, 1978) by Sal Buscema (pencils) and Joe Sinnott (inks). Splash features a jubilant Human Torch fully ablaze as he scorches the night sky with the famous "4" symbol, announcing that the Fantastic Four are again a team ready for action and adventure. Any Human Torch collector would be hard pressed to find a better image than this of O'l Hot-Head. Truly, a terrific splash page in every aspect possible displaying a magnificent image. There is some light staining at bottom left corner and in the indicia with some spotting in the "4". Otherwise the art is in excellent condition with image measuring 10" x 15". The item "Fantastic Four Annual #13 Original Splash Art by Sal Buscema 1978" is in sale since Thursday, December 04, 2014. This item is in the category "Collectibles\Comics\Original Comic Art\Splash Pages". The seller is "water-walker" and is located in San Diego, California.